At Allegheny Veterinary Services, your pet is important to us! We proudly provide state-of-the-art medical care, customer service, and compassionate, personalized care for each patient at our modern animal hospital. We are honored that you have chosen our full-service small animal clinic to provide veterinary care for your pet in the Elkins, WV area. It is our goal to provide excellent veterinary care to every patient with compassion, dedication, and personalized service. We are committed to practicing evidence-based medicine. We enjoy educating our clients regarding the latest advancements in our field to help our patients to live long, healthy lives. 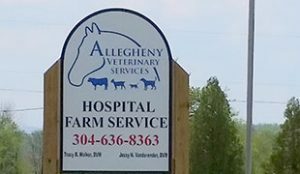 Allegheny Veterinary Services is a full-service small animal veterinary practice based in Elkins, West Virginia. AVS was established in 2015 after combining two area practices, the Beverly Pike Veterinary Clinic and Allegheny Equine Veterinary Service. The Beverly Pike Veterinary Clinic, originally established in 1974, by Dr. G. Jay Crissman, long upheld its reputation of offering new treatment modalities and advancements in veterinary care. Dr. Crissman retired in 2015. By combining the two practices, we are now able to offer additional availability, as well as new diagnostics and services. Since opening, the practice has offered advanced diagnostics and services that were previously unavailable in the area. In recent years, it became apparent that an expanded facility was required to provide additional availability of small animal veterinary care. In May 2015, we opened our 5,000 square foot hospital in Elkins, West Virginia. The practice continues to offer ambulatory care for large animals, along with enhanced care in a hospital setting.